It wasn’t like this when I was a lad. England was a culinary desert. If you were on the road, you had nary a hope of stumbling across a decent eatery on your travels. A dusty pork pie, perhaps, or a soggy, oil-laden portion of fish and chips served up in some God-forsaken, yellowing waterhole somewhere. A little harsh, maybe, but nonetheless true because of it. And it makes me marvel at how things have changed. I took the family for a getaway for a few days in the Cotswolds recently. It’s a green and pleasant land, stuffed with interesting places to go, affluent and enjoyable. And seemingly every village we stumbled across had a pub of staggering quality. And so we embarked on an epicurean journey we weren’t quite expecting. 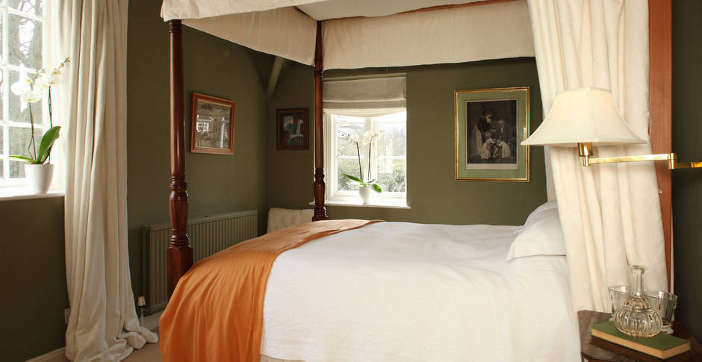 Our base camp was Bruern Cottages – a charming collection of warm Cotswold cottages and converted stables in a picturesque mews opposite Bruern Abbey. It’s a very clever take on self-catering for the sophisticated. 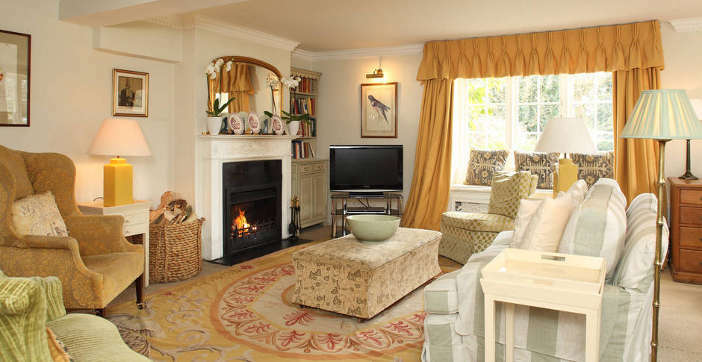 All the properties are set within the timeless elegance of a country dwelling in a quiet, leafy corner of old England. In the grounds of former Cistertian Abbey at Bruern, these properties have been tastefully brought to five star standard with every possible modern convenience and useful appliance to hand. On your arrival, expect fresh eggs, butter, milk and ahem, Champagne in the fridge; there’s a homemade Victoria Sponge on the kitchen table. The fire is laid, the four-poster bed awaits and a private garden complete with towering sycamores and a fully prepped gas barbecue is at our disposal. 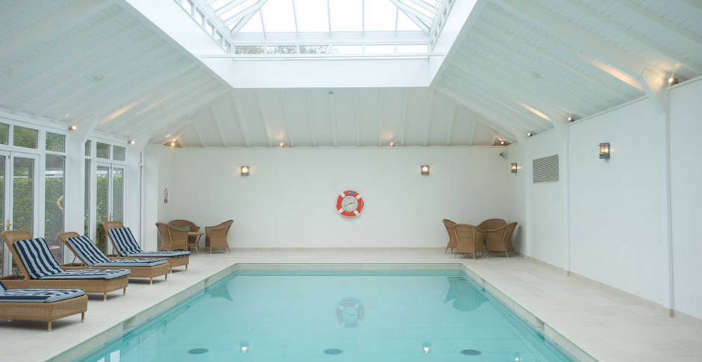 As is a play room for the kids, luxurious indoor swimming pool, bicycles, toys, walks and anything else you can think of that would enhance a stay in the countryside. And Bruerne’s Crossing seems to be the very epicentre of the gastronomic explosion I referred to. Strike out in any direction and you’ll come across the welcoming sight of a hostelry stuffed to the gills with all kinds of goodness. The Chequers at Churchill, for instance. This is a really funky place. There’s mounted butterflies and a hock of Iberian ham and a stuffed croc called Colin on the bar. And there’s a lovingly tailored menu of seafood and carnivorous splendours including the always-welcome Chateaubriand. Portland Bay oysters were my starter of choice, the first time I’ve had the pleasure of these little beauties; fresh, light and delicious straight out of the shell. They were washed down with a liquorice house Tempranillo and a pungent Bouillabaisse which was deeper than Roman Abramovich’s pockets. Wonderful dark, fishy flavours. The rest of the team tackled steaks and fish and made similarly appreciative noises. This is serious food served in a fun place. A must. The following day we toddled off in search of adventure and soon found it in Bourton on the Water. Birdland lived up to expectations with feathered friends of every hue – including the prehistoric Maribou Stork sentry who stood guard at the gate even when the Heavens opened. I wonder if he ever eats the sleek brown trout we saw idling in the crystal waters of the passing River Windrush? There were tiny owls for the girls to hold, King Penguins to watch, parrots to marvel at and dozens more including hornbills, ostrichs, pelicans and plovers. The weather was foul but it didn’t deter us and we found shelter in the warm den built to house the beautiful borrowing Bee Eaters. Continuing the avian theme, we also dropped into the Cotswold Falconry Centre next to the wonderful Batsford Arboretum. If you like birds – and we clearly do – this is a wonderfully kept snapshot of some of the world’s most impressive birds of prey from Caracaras from Argentina to Bald Eagles from the USA. There are regular and informative flying displays throughout the day. Each night we slunk back to our peaceful cottage, basking in the sough of trees. I found a windless spot in the lee of a yew hedge which proved the perfect place for a stargazing cigar. 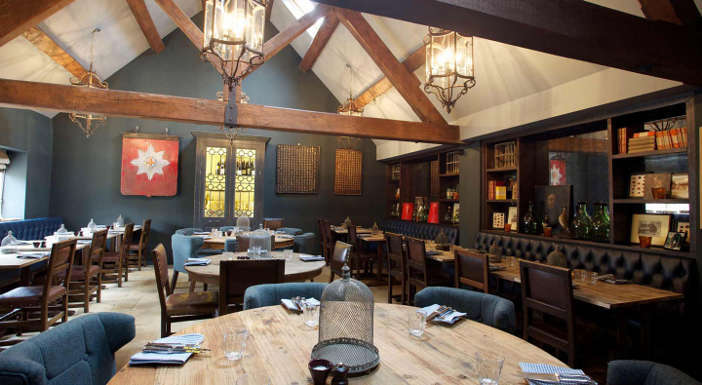 The Feathered Nest in Nether Westcote has a special place in my heart; some years back my family enjoyed a garrulous breakfast there en route to a memorable event in Devon. It’s been taken over by eccentric Dutchman Tony Timmer who has transformed a picturesque pub into an eatery and stopover of staggering proportions. Overlooking glorious countryside from its vantage point on the side of a hill, The Feathered Nest now includes elegant walk-in wine cellars and truly epicurean menus. Consider my opening gambit bemoaning the wilderness years of British hospitality; now consider I ordered suckling pig followed by lobster in The Feathered Nest. An exquisite ray dish and intricately crafted food in a stunning location is what sticks with me about this place; it is almost ethereal in its perfect fit for time and place and as we left, slightly dazed with food, wine and the place in general, we stood in the garden and breathed in the sweet air of autumn to try to clear our heads. Our gastronomic week ended happily at The Kingham Plough. It’s another welcoming inn that’s taken time to create something novel and different. There’s a ‘Tapas’ menu here for starters of glorious British titbits; warm homemade quail’s Scotch eggs or crusty pork pie; snails and mushrooms with garlic butter; homemade venison salami. We sampled pigeon wrapped in Kelmscott bacon and plaice with pickled cockles and rock samphire. Once again, a family-friendly destination to gladden the heart and local Guernsey milk is even sold out of a vending machine in the car park. How cool is that? Our final night at Bruern Cottages was a wrench. The muntjac deer which grazed in our garden was now a friend. The bikes the girls rode had become ‘theirs’. The swimming pool which they splashed in every day was their private luxury spa. But after one last cigar as clouds scudded across the darkling sky, I retired to the peace of my four-poster, sad but sated. It wasn’t like this when I was a lad.